Transport Pricing Policy and the Research Agenda. (C. Nash, B. Matthews). Alternative Pricing Doctrines. (E. Quinet). Infrastructure. (H. Link, J.-E. Nilsson). Operating Costs. (O. Betancor, M. Carmona, R. Macario, C. Nash). User Costs and Benefits. (C. Doll, J.O. Janssen). Accidents. (G. Lindberg). Environmental Costs. (P. Bickel, S. Schmid, R. Friedrich). The Impacts of Marginal Social Cost Pricing. (I. Mayeres, S. Proost, K. Van Dender). The Social Costs of Intermodal Freight Transport. (A. Ricci, I. Black). Measuring Marginal Social Cost - Methods and Transferability. (M. van den Bossche, C. Certan, S. Veldman, C. Nash, B. Matthews). Policy Conclusions (C. Nash, B. Matthews). Many transport economists have for some time proposed marginal social cost as the principle on which prices in the transport sector should be based and, in recent years, their prescription has come to be taken more and more seriously by policy-makers. However, in order to properly test the possible implications of implementing pricing based on marginal social cost and, ultimately, to introduce such a system, it is necessary to actually measure the marginal social costs concerned, and how they vary according to mode, time and context. 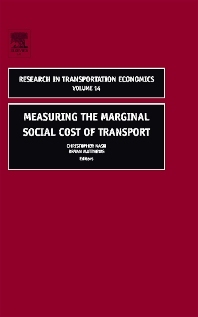 This book reviews the transport pricing policy debate and reports on the significant advances made in measuring the marginal social costs of transport, particularly through UNITE and other European research projects. We look in turn at infrastructure, operating costs, user costs (both of congestion and of charges in frequency of scheduled transport services) accidents and environmental costs, and how these estimates have been used to examine the impact of marginal cost pricing in transport. We finish by examining how the results of case studies might be generalised to obtain estimates of marginal social costs for all circumstances and, finally, presenting our conclusions. Researchers and students of transport economics and the formulation and implementation of transport pricing policy.